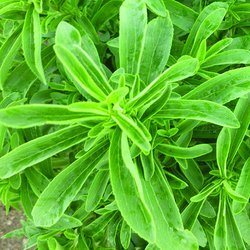 Stevia is a fairly low growing plant reaching up to 30cm tall with white flowers. Broad oval serrated green leaves that can be used as a substitute for sugar&comma; but without the calories!! The leaves can be ground down into a powder and used like sugar or pop a leaf into your herbal tea and stir. Once the plant has established.